Mix 2 cups water with 1 cup ice cubes in bowl. Combine 4 cups flours, sugar, salt and yeast in separate bowl. Vigorously stir 1 3/4 cups plus 2 tbsp ice water into flour mixture. (Dough should be slightly stiff; stir in just enough additional flour to stiffen slightly, if necessary.) Brush dough top with vegetable oil. Cover bowl with plastic wrap and let rise at room temperature 12 to 18 hours (first rise). Stir powdered buttermilk and melted butter into dough, scraping down bowl sides. Stir in remaining 1/2 cup flour, plus more as necessary to yield stiff but still stirrable dough. Lift and fold dough toward center with spatula. Brush dough with vegetable oil, and cover with plastic wrap oiled on side facing dough. Let dough rise 1 1/4 to 2 1/2 hours at room temperature (second rise). Place oven rack in lower third of oven, and preheat oven to 450°F. Brush 4-qt. Dutch oven with oil, set on oven rack, and heat until sizzling hot. Transfer dough to Dutch oven. (Don’t worry if dough is lopsided and ragged-looking; it will even out during baking.) Brush top of dough with water, then sprinkle with coarse salt, if using. Slash large X in top of dough with knife or kitchen shears; cover pot, and shake to center dough. Lower oven temperature to 425°F. Bake bread 50 to 55 minutes. If loaf is browned, leave lid on; if not, remove lid. Bake 10 to 15 minutes more, or until skewer inserted in thickest part of loaf comes out with just a few particles. Bake 5 to 10 minutes more. Cool 15 minutes in pan; unmold, and cool on wire rack. I first discovered and wrote about Easy Buttermilk Pot Bread on my blog back in early spring, when the weather was still cool but thawing and growing green and rebirthing itself from a long, icy, chilly winter. It was a rainy day -- much like today is here, actually -- and I was complaining about how the clouds weren't helping my photographic endeavors. Now I would continue to complain about how rainy days are horrible for my photos, but after the documentary I watched yesterday, I hesitate to curse the sky. The movie I watched, called "Full Circle," is about a man named Eustace Conway. I won't go into the details of his life story, suffice it to say he lives in the woods, off of nature, and has done so for more than 20 years of his life. One of the things he often tells people is that nature is circular, or cyclical. Almost everything in nature functions in a cyclical pattern or is literally shaped like a circle -- tree stumps, birds' nests, what have you. And here we are, all of us living in boxes and eating out of boxes and driving in boxes from one place to another. Eustace says that by living in boxes, we aren't in tune with the laws of nature. I could go on and on about this topic because it something near and dear to me, but I won't -- we're here for the bread. But I found it coincidental that, after all this talk of circles, this very bread is shaped in a circle made from the pot in which it is baked. And for generations, bread has consistently been at the foundation of food (people even wrote songs and poems about it, but we won't go into that, either). All this to say, there's something about bread that, to me, is very much connected to nature. The way it's made, the way the yeast is alive and makes the bread rise on its own, the way you have to get your hands into it to make the dough smooth and bake-ready (except for this loaf, which is no-knead, a nice convenience) -- well, it's all very intimate, and that's what I love most about baking bread. 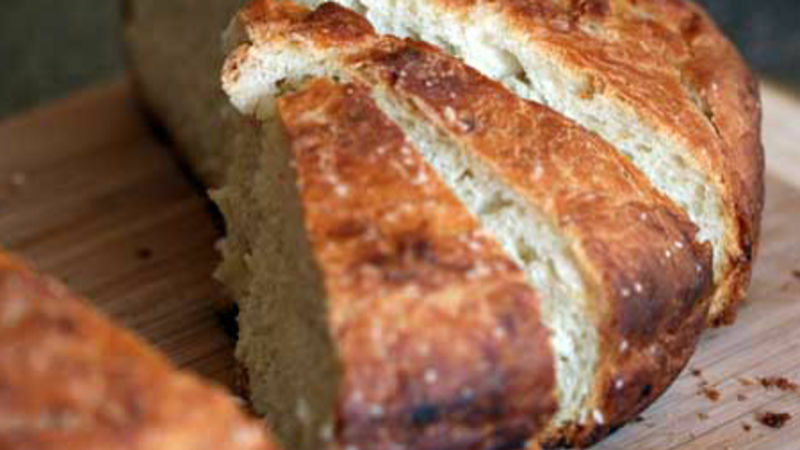 This Easy Buttermilk Pot Bread is just that -- easy to make. And instead of putting it into a boxy loaf pan, you put it in a pot, which gives it its unique shape. The flavor is slightly buttery, and with its salty, crunchy, thick crust, a warm wedge of it is delicious all on its own. Now that the weather is cool again, the leaves turning brown and gold and everything is preparing for winter, it's a perfect loaf for those gray, rainy days. Even if it makes for subpar photographs, that's OK -- nature needs to run its course.